A diapason. Tuned at 440Hz it is used as reference by musicians. I was wondering why the note “A” seems to have ever been the reference note for tuning but I didn’t find the answer. This paper is therefore a pure speculation, hoping that someone might have the true answer. Pitch: The pitch is the relative position of a sound in the scale, i.e. the height of the sound. It is related to frequency. Frequency says how often a vibration occurs per time unit. Vibration is sinusoidal curve travelling up and down a resting line that forms a cycle. Hertz is the modern unit for frequency and worth one cycle per second. The bounds of audibility for human ear are roughly from 40 to 5000 hertz. As long as orchestras were made of spare instruments almost any frequency could be the reference to tune them up but modern big orchestras with double bass and piccolo-flute cover a large range of frequencies which are very near the bounds of audibility. That is the main reason why a fixed value had to be determined; others physical factors such sound speed had also to be taken into account. 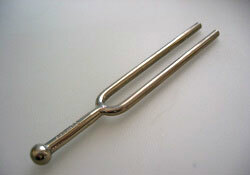 After the Vienna Convention of 1885, the standard became a tuning fork which yields 435 cycles per second (435 Hertz). Some more recent enhancements in instruments factory, such oboe, led to choose new values 440-442 Hertz. But why the 442 Hertz is assigned to A? A simple explanation could be that “A” (sixth degree of the C major scale) is highest degree of the scale to support a perfect fifth. Clearly, that is not the reason which probably stems from solmisation evolved by Guido d’Arezzo (XI century). With 4 homogenous strings, named CFGC, which are respectively 12, 9, 8, 6 units long, such as shown in image No. 2. Numerous experiments resulted in a theory using combinations of 3 kinds of tetracord (set of 4 notes) based on perfect fourths that led to many different scales. 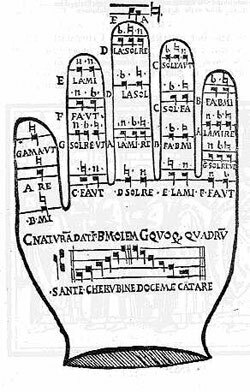 A peculiar scale (called systema teleïon), consisting of two diatonic octaves (from A1 to A3) made of two disjoint tetracords, was rediscovered in the middle age. Here is the origin of the English and German notation. The B of the upper octave might be either flat or natural. Some extensions led to a 21 notes scale from G (one degree below the original scale) to D (a fourth above its highest degree) noted by means of letters as sown in image No. 3. To get the notes easier to sing, Guido d’Arrezo (around years 980 or 1050 according to authors) assigned a syllable to notes (the solmisation or solmization from which solfeggio comes) and reduced to six the name of notes (ut, re, mi, fa, sol and la) which is the base of the present notation in Latin countries. However, the hexacord (the set consisting of the six notes) did not represent a specific tone but a sub scale made of the series tone-tone-semitone-tone-tone. Such alternation of tone-semitone applies to three locations on the teleïon scale; therefore “ut” meant either C or G or F and determined whether the moveable B was natural or was flat. Beside the improvement in singing, the hexacord importance rested in transposition possibilities and counterpoint rules elaboration. Naturally this does not directly explain the “A”. The range for average human voices (F2 to G5) requires a fictive 11 lines score with C3 on the sixth line. For readability score has been reduced to five lines with the letter C placed on the sixth line, F on the fourth line and G on the eighth line so that the part of the fictive score could be identified. Here is the origin of clefs. Hexacord and central C put together enlighten the possible origin of “A” note as reference. It must be pointed out that Bach respected the old rule of the “mi-fa hexacordum” that stated “when a melody reaches occasionally the seven degree of the scale it must be flat. Historical origin of hexacord is therefore a useful notion to know when the score is ambiguous.